wall mounted TV looks great. But trailing cables can spoil the image. Solve the problem by booking one of our specialist engineers to mount your TV for you and embed the cables neatly within the wall. Booking a visit from our engineer is easy. When you buy your TV from Ebuyer.com simply add this product to your basket. Checkout in the normal way and we will be in touch within a few hours to arrange a time and date for our engineer to call. We will do a brief telephone survey with you to confirm an installation is suitable for your TV and location. When our engineer arrives at your property he/she will conduct a site survey to confirm the wall is suitable and can support the TV. The engineer will then review the survey results with yourself to confirm you are happy. You will then sign-off authorisation for the engineer to begin work. The next step is for the engineer to unpack the TV and fit the bracket to the wall. Once done the TV will be fitted to the bracket. Next the engineer will 'chase out' the wall and secure the cabling within the wall. 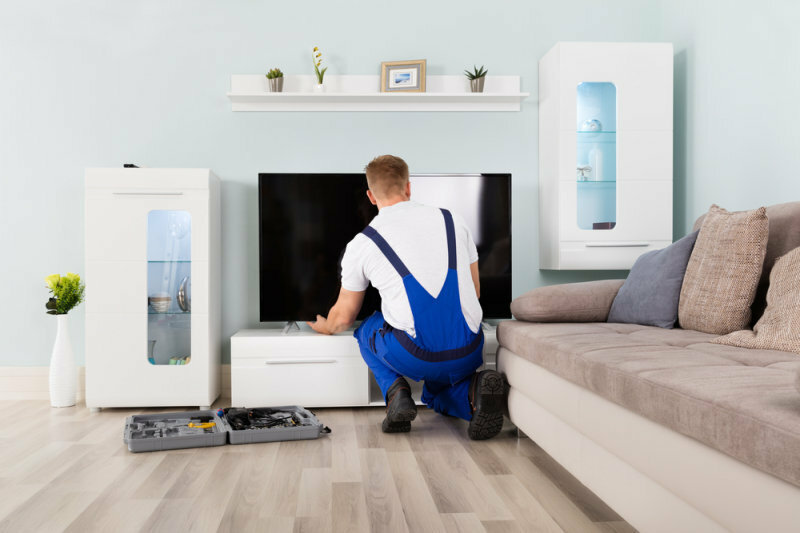 Once everything is installed the engineer will connect your television to two TV devices of your choice (Sky, Freeview, DVD player etc.). A smart TV will then be connected to your wireless network and the engineer will demonstrate the features of your smart TV. Finally the engineer will apply a single layer of plastering to the wall. You will need to finish and decorate this area at a later date. The engineer will then tidy up before leaving. Set up your sound bar or home theatre system. Set up more than two TV devices. Repair or install digital aerials. Add this product to your basket with your projector purchase. Within 4 hours of purchase* a member of the Ebuyer team will contact you to book your installation date. We've partnered with Order Works, one of the UK's largest service providers to supply this service. All installers are fully qualified, insured and meet our high standards of quality. Within 4 hours of purchasing this service* you will be contacted by a member of the Ebuyer team to book your installation service. We aim to have your installation booked in within 3-5 working days although availability can vary based on your location and demand. *Within 4 hours of purchasing: If order is placed before 4pm on a weekday and excludes weekends. For purchases made on weekends or Bank Holidays customers will be contacted before 11am the next working day.